My daughter took this picture of Zola and her cub Gramby. Zola had two cubs which was a real surprise to the zoo keepers at the Norfolk Zoo. 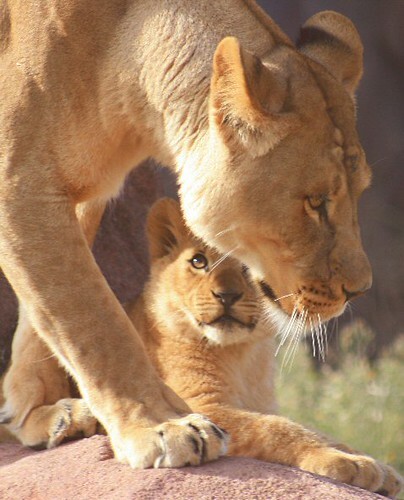 I love how the picture captures the cubs attachment to his mother. I take pictures that record a thing exists. My daughter takes pictures that record the soul of a thing. Mother's Day is a little sad for me, because all the Moms are gone. But I remember my own mother with love and more then a small bit of laughter. I love the photo's. Now that I'm a mom, I find it incredibly crazy that anyone would deny the bond between a mother and her child no matter what the species is. Its also amazing that a child just knows who its mommy is. Despite all of the other females around they just know who is their mom. Its the most precious thing around. Thanks for the link to Dawn's Gallery, she takes awesome photos. Lots of good ones. I really liked her photo of the dragonfly. Hope you recover from your cold soon. Check your ravelry email, girl. great photos and I wish you nothing but love! Isn't it nice that this picture proves the fact of the emotion? I have enjoyed viewing all of your projects and especially the pictures from you daughter. She is very talented. I will check back to see what you two are creating! Thank you for the nice comments you left me Suzann. I understand you have done some tatting. That is very interesting. I have been wanting to learn that technique since i was a young girl but I never have, for some reason. The only time I did try was ages ago. My mother tried to teach me but my thread got knotted and I soon gave up. Now I regret not having been more firm in my intention..Oh, well..it's never to late to try..